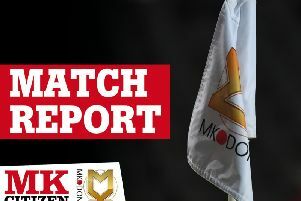 MK Dons held on for more than 68 minutes with nine men but still managed to come away with victory in an astonishing game with Peterborough on Saturday. Joe Walsh and Osman Sow were both shown first half red cards, either side of a Chuks Aneke cracker, while manager Robbie Neilson too was sent off from the dugout in a game with too many talking points to mention. Before the game, many questioned whether Robbie Neilson would keep his job, but on the basis of this performance, with his entire team remaining on the field sacrificing themselves to block everything Peterborough had, few will have many qualms with the end result. Scott Golbourne returned to Dons' back line having missed the last two through injury to give the defence a much more familiar feel, while Ouss Cisse made his first start since October having had knee surgery. Gboly Ariyibi and Kieran Agard were dropped to the bench, as Osman Sow and Chuks Aneke started up front in a 4-4-2. With just one win in 13 games, Dons went into the game in desperate need for a win to move themselves away from the relegation zone, but they were dealt an early blow when, having already had a warning earlier in the game, Jack Marriott used his pace to get in behind the Dons defence but when he got in again, was brought down by Joe Walsh offering referee Charles Breakspear no option but to send him off. Dons though didn't appear to let the numerical disadvantage affect them in the immediate aftermath, and Peter Pawlett will have kicked himself not to have had a goal to his name inside the opening 22 minutes at least, having squandered two great chances as Dons pressed on. Cisse, slotting in to replace Walsh in defence, adapted well to his positional change, and marshalled that back line as he barked orders and kept close tabs on the lively Marriott. The home side were very much in the ascendency in the early going so it wasn't much of a surprise when Dons in fact took the lead. A short corner from Pawlett make it's way back to Aneke on the edge of the box but with his back to goal, he opted to turn Ryan Tafazolli and lash a fierce strike on goal, taking a deflection to beat Jonathan Bond and give Dons the lead. But incredibly, Dons were dealt another serious blow in the shape of a second red card, this time for Sow who was deemed to have caught Tafazolli with a high boot. Referee Breakspear had no doubt in his mind, immediately whipping out his red card, leaving Dons to play the remaining 55 minutes with nine men. As if to make things worse, Dons emerged for the second half without manager Neilson, who was sent off during the interval. But Aneke continued to be a thorn in the side of Peterborough, almost single-handedly leading Dons in the attacking half as he won a couple of corners and even led a remarkable three on three counter attack, foiled only by Conor McGrandles straying offside. Inevitably though, Peterborough were peppering Lee Nicholls' goal, but the keeper was proving a match for them, brilliantly denying Marriott the pick of the bunch. They kept coming too, with Maddison thumping the crossbar from close range as Posh piled everything at Dons' goal. But the frustration was ever growing for the men in blue as Dons defended fiercely, boldly throwing themselves in front of everything the visitors had to offer. And they were given another nine minutes of time added as Dons spent much of the second period desperately killing time in a bid to see the game out. But try as they might, it was Dons who had the better chance in stoppage time when after yet another defiant Alex Gilbey block, Kieran Agard countered half the field but blasted his effort wide of Bond's goal. Incredibly though, despite the odds, Dons held on to take a remarkable victory, with every player roared off the field by the buoyant home crowd, just as astonished by that they had just seen.